This award is kind of a fun one. It is for female bloggers to encourage the spirit of sisterhood. I received the award a fellow (sister) blogger at Recovery Corner. 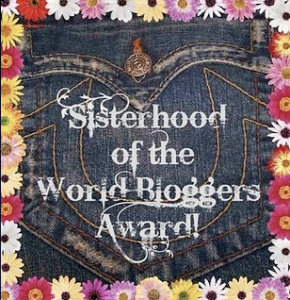 I have recieved several awards in the past week and haven’t had time to acknowledge all, but this is an award that especially encourages sisterhood in blogging. That is very special to me so I want to take this opportunity to acknowledge it. 1. At the age of 60, I started taking Karate and love it. 2. Last week I resigned from my job of 12 years. 3. I would love to live in a houseboat someday. 4. I try very hard not to be, but I am still a bit insecure. 6. I want to meet Anne Lamott..and someday I will. I am going to nominate some sister bloggers I haven’t nominated before. I love being nominate for awards and I love sharing the joy with others. Thank you all for reading and commenting. hahaha. My first car was a Vega–man, I loved that thing! Congrats on the award. Congrats on the award. I love it! And congrats on the resignation and aren’t you a badass with the karate? Congrats on the award and thank you so much for the nod! I am just thrilled! THANK YOU! awww I am HONORED and HUMBLED, thank you Ms. Cathy! I am heading to an appointment but will be back to fulfill my duties of the award and pay it forward! See you shortly!